Healthcare administration is a huge field for students that are interested in widespread and challenging careers. Degree programs within this field can teach many topics that can contribute to more effective leadership, specialized skills, or even widespread knowledge about how this field operates. For those that are interested in working in more concentrated fields, the MHA has different options for you to pursue with your general MHA degree. These options vary in terms of what subject matter is covered and what types of careers they can help you obtain. The Master of Healthcare Administration - Financial Management is a great option for students that have an interest in mathematics and critical thinking. Financially, healthcare facilities require a lot of attention, since the inflow and outflow of capital through these organizations are so large. Professionals within this field can work to ensure that financial activities are going according to plan and implement strategies for change if needed. They may also work individually or with a large group, depending on the size of the facility they are responsible for. The financial aspects of an organization are some of the most important when determining how well a company is functioning. People that focus on the financial standing of organizations can be extremely useful in future planning, current situational analysis, and complex start-ups. If you might be interested in becoming a part of the financial field within healthcare administration, a financial management specialization may be a great option to pursue for your future. In order to make you journey to educational and career success a little more smooth, our team of educational experts has researched some relevant MHA – Financial Management degree programs across the United States. In the guide below, you can learn about the actual degree program, the career, and the benefits of choosing a degree in this field. In MHA – Financial Management degree programs, students are often tasked with learning new concepts and ideas that may have not been present in undergraduate education. Since this field takes into consideration the need for effective accounting and balancing, these concepts may come up more often than not in these programs. The list of concepts below can help you familiarize yourself with what may be covered throughout this degree program, as well as some of the skills that may be present in the actual career field. Read along below for more information. Time Value Analysis: This concept is based on the idea that money held in the present contains more worth than money in the future. Students learning this concept can learn more about how interest can play a role in increasing the worth of money held in hand. Financial Risk: In terms of business and investment, the concept of financial risk is a huge subject. Students delving into topics regarding financial risk can learn more about how investments can sometimes go the wrong way and cost investors more than they originally put in. Required Return: This topic is concerned with investments and gaining the attention and funding of potential investors. The required return is often a figure that investors request prior to investing in a company looking for their sponsorship. Capital Allocation: Capital allocation is a huge part of the business practice. This topic explains how companies and individuals split up capital within their organization in order to obtain the most wealth for those concerned with its progress. Financial Condition Analysis: In this topic, students can learn more about the methods and guidelines for reviewing and analyzing the financial state of the company in which they work. Different research areas and tools may be part of this topic. Financial Forecasting: Business people use financial forecasting to determing the future output or outcome for the business in which they work. This is used during the planning process to ensure that ample materials are available, pricing is set accurately, and pre-planning for production is completed according to the future forecast. From an outside perspective, the Healthcare Management and Business Management degrees may have a lot of similarities. Both degree programs focus on the leadership aspects of running a busy operation, while one focuses more specifically on the healthcare field and the other is generalized to the field of business. Students that are interested in either of these paths should consider the destination of both routes before making a decision as to which program to enroll in. A Healthcare Management degree in Financial Management can lead to careers in a hospital or healthcare setting. In this career, you might be in charge of personnel training, program planning, and financial maintenance of a healthcare facility. The majority of the staff you may come in contact with may be nurses, doctors, and other healthcare personnel that are employed within this setting. In Business Management career fields, you may be responsible for leading a team of professionals in many diverse fields of business. You might oversee the production of automobiles or electronics in a large organization, or even provide guidance and leadership in a corporate setting. Your job responsibilities may include reporting progress to higher leadership, ensuring that employees are working according to company guidelines, and taking part in meetings that take place in order to increase the quality of work for your organization. Sometimes reading about the degree program is not enough to truly engage you about the curriculum. Our team has listed some of the specific courses available in this degree program below for you to review. The school you go to can have a drastic effect on the type of classes you take and the subject matter than can be covered in each. As you can see in the list below, the curriculum for this MHA program can contain similar courses as those that focus on accounting and other financial-oriented topics. If you have previously graduated from a financial-related degree program, these courses may refresh you and build upon what you have learned in lower-level educational courses. Take a look at the list below. Management Accounting: This course can help students learn more about the methods used to report financial information regarding management performance. Students may also learn how this information is used during the decision making process in order to make more effective leadership decisions within an organization. Financial Decisions and Policies: Students that enroll in this course may learn more about the investment decisions placed on management professionals in the healthcare field. Students can gain more information about making sound decisions that can help increase their organization’s value, which could help them withstand the test of time. Students may dive deeper into the financial policies that surround the healthcare field, and the role of stakeholders in the investment process. 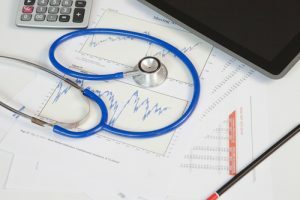 Healthcare Financial Management: This introductory course can teach students about the role of financial managers in the healthcare field. Accounting terminology, financial reports, and budgets may be discussed throughout the duration of this class. Students that take this course can learn more about these topics specifically in conjunction with normal operations in the field of healthcare. We wanted to pull a few examples of schools that offer a Masters in Healthcare Administration and try to give you an estimate of the length of program along with total cost. It should be noted that these are estimates based on the per credit hour cost and info available on their website in 2018. The healthcare field is one of the largest employers in the United States. A majority of people within the country are affected by the healthcare field, which is probably why so many people seek careers within it. If you are interested in becoming a part of this incredibly large and diverse specialty area, MHA degrees can provide a great opportunity for you to do so. In financial management degree programs, you can learn the skills needed to effectively operate or manage financial areas of healthcare organizations. This is a vital component for these entities, so professionals that specialize in financial management may be highly sought after to accept positions. Having a degree plus some experience in the field of healthcare may be able to help you obtain even more prestigious positions in the field of healthcare. As a financial professional, you could find careers working for popular hospitals, specialty healthcare centers, or even with organizations that focus on the secondary aspects of healthcare, such as insurance or with the government. Your responsibilities within this field may vary depending on where you work. Most professionals in this field may be responsible for allocating funds within their organization, planning for spending or income, and preparing financial statements for yearly repots. The figures listed below are national averages from some of the most popular career fields in the healthcare-financial area. Financial Managers: $121,750 on average per year (BLS). What are some of the job duties of the healthcare financial manager? The healthcare financial manager may have a diverse role in the hospital or healthcare facility in which he or she works. On a daily basis, these professionals may make important purchase decisions, create financial statements, budget costs versus income, and ensure that employees receive compensation for their work. These professionals may also work with a larger team that plans and coordinates daily operations within the healthcare setting. What type of healthcare setting could I work in? As a financial professional in the field of healthcare, there are many different settings that you could potentially work. The largest and most popular setting is within large hospitals. However, having a specialty in financial management could land you positions in corporate health-related organizations, rehabilitation centers, research facilities, and even with the government. Healthcare is an incredibly widespread field that holds the interest of many types of businesses. What are some attributes that could be beneficial in this field? Students that have a strong background in mathematics and accounting are a great fit for this field. You should also have great problem-solving skills, have the ability to multi-task, and a diverse knowledge of computers and computer information systems. Since most of the work of the financial manager is through computer programs, you should enjoy working with complex systems that may be required for healthcare accounting.